There's no beatin' around the bush with this author, he tells it like it is. And though his point of view can come across as arrogant at times, I have to agree with just about everything he says. America has definitely strayed far from our roots when it comes to food. Salatin reminds us of just how far we have digressed as a society. From farm to table our food travels an average of 1500 miles, shocking when you consider farming used to be a way of life for most families. Now most people wouldn't know where to begin to grow or raise their own food. In just a few short generations, we've created laws and requirements that tie the hands of small farmers to the point that they can hardly make a living from their own land anymore. There is a plethora of hoops one must jump through to be able to sell produce, eggs, meat, dairy, etc. And each limitation and obstacle is tied to another limitation or obstacle creating a big tangled mess. 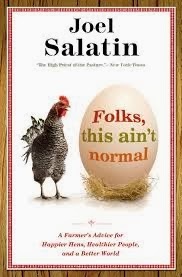 But Salatin addresses many small ways in which we can attempt to restore some sort of "normalcy" back to our nation. You may not be a farmer, but there are tiny steps you can take to improve your quality of nutrition and restore some sense of sustainable, healthy living like cooking from scratch more often, buying local produce, eating what's in season, growing edible landscapes, preserving food, the list goes on and on. The book strikes a chord with me because the author is so passionate about many of the things I am passionate about. He not only sheds light on some of the ways our culture and our government hinder local and sustainable food production, but also offers insight on how to remedy them. He's old-fashioned in many ways, but so am I. Sometimes I felt like I was reading words right out of my dad's mouth. To say he and I grew up in similar homes with similar values would be an accurate statement. It was an easy read for me, but I can imagine that his words might stick in the craw of some people I know. As Richard Louv put it, "Sacred cows beware. "That being said, I wish everyone would read this book. It would make for some excellent discussions and it just might get people thinking in a direction they hadn't considered before. I'm pretty sure that was Salatin's intention after all. Homemade "Clif Bars" or "Lara Bars"